While the so-called "advanced economies" of the world, the G7 or G6+1, were squabbling over trade issues with the world's dominant economy, the United States, on the other side of the globe, the world's other economies were getting down to business and giving us a sense of who will dominant the global economy in the future. Let's start with a brief introduction. The Shanghai Cooperation Organization was announced on June 15, 2001 and its charter was entered into force on September 19, 2003. The original members included the People's Republic of China, Kazakhstan, the Kyrgyz Republic, the Republic of Tajikistan, the Republic of Uzbekistan and the Russian Federation. In 2017, both India and Pakistan were granted status as full members. There are also four observer states; Afghanistan, Belarus, Iran and Mongolia. There are six dialogue partners; Azerbaijan, Armenia, Cambodia, Nepal, Turkey and Sri Lanka. 4.) moving towards the establishment of a democratic, fair and rational new international political and economic order"
The supreme decision-making body in the organization is the Heads of State Council or HSC. The HSC meets once a year and adopts decisions and guidelines on important matters of the organization. President of the Republic of Uzbekistan Shavkat Mirziyoyev. There were other key figures in attendance including the President of Afghanistan Ashraf Ghani, the President of Iran Hassan Rouhani, the President of Belarus Alexander Lukshenko and the Deputy Secretary-General of the United Nations Amina Mohammed among others. 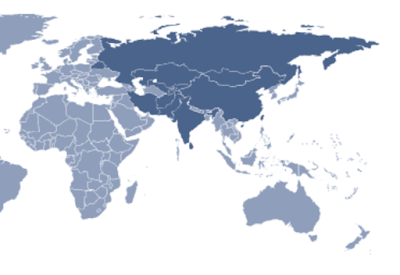 The Shanghai Cooperation Organization also seeks to cooperate with other international and regional organizations including the Commonwealth of Independent States (CIS), the Association of Southeast Asian Nations (ASEAN), the International Committee of the Red Cross (ICRC) and the United Nations among others. As you can clearly see, the SCO's member states are attempting to simplify trade procedures by decreasing customs formalities on imports and exports and on goods that are in transit as part of the group's move to further develop mutual trade among member states, a logical move given their close geographic proximity. Given the recent trade actions by the United States against its largest trading partners (after all, "trade wars are easy to win") and the ongoing sanctions against Russia, Iran and North Korea, this approach to international trade and cooperation is rather unique. "An important track of SCO activity is the development of mutually beneficial economic ties between our countries. Trade and investment are gaining momentum. We are simplifying the mutual availability of goods and services, improving customs regulations, eliminating unnecessary administrative barriers, and implementing joint projects in energy, transport and agriculture. We are working on several integration initiatives between our countries. In May, a cooperation agreement between the Eurasian Economic Union and China was signed in Astana, Kazakhstan. It is important to take additional steps that would lead to increased coordination in the implementation of trade, investment and infrastructure projects through the EAEU and China’s Belt and Road programme. Russia and China are also preparing an agreement on the Eurasian Economic Partnership, which, of course, will be open to all the SCO countries." "Over the past 17 years, guided by the SCO Charter and the Treaty on Long-Term Good-Neighborliness, Friendship and Cooperation Between the Member States of the Shanghai Cooperation Organization, we have forged a constructive partnership featuring non-alliance, non-confrontation and not targeting any third party. In doing so, we have achieved a major breakthrough in the theories and practices of international relations, created a new model for regional cooperation, and made new contribution to peace and development in our region. The Shanghai Spirit is our shared asset, and the SCO is our shared home. We should, guided by the Shanghai Spirit, work closely to build an SCO community with a shared future, move toward a new type of international relations, and build an open, inclusive, clean and beautiful world that enjoys lasting peace, universal security, and common prosperity." The co-operative sentiment of both of these speeches is in sharp contrast to the tensions and the message of "it's our way or the highway" that was the underlying tone of the G7 summit. It is also key to note that the member states of SCO account for 40 percent of the world's total population. According to the Asia Times, Russia and China partnered with Rosatom to get advanced nuclear technologies and diversify nuclear power contracts outside of China's current Western suppliers. As well, Russia, China and Mongolia negotiated a trilateral deal that will see Mongolia act as a transit hub for pipelines that will deliver Russian gas to China. This is in addition to the 2.7 fold increase of container traffic along the route of China - Mongolia - Russia to Europe over the first quarter of this year. China and Russia will also partner to develop the Northern Sea Route which will involve the modernization of deep water ports in Murmansk and Arkhangelsk. From what the world saw reported from the dysfunctional G7 (or G6+1) summit, the infighting seven member group clearly represents the "old order", the way that political and economic business was done when Europe and North America were in charge of the global economy. With the rise of the East as represented by the Shanghai Cooperation Organization, in particular Russia and China, it is quite clear that there is a new global reality and that the political and economic leadership template of the past is just that, the past. It is also clear that the sanctions imposed by the West against the so-called Axis of Evil will become increasingly ineffective as North Korea, Iran and Russia look outside of the West as their source of economic well-being.